The mole salamanders are part of the genus Ambystoma. There are a group of animals that live in North America. The only family in this genus is the Ambystomatidae. The Axolotl (Ambystoma mexicanum) is a popular exotic pet. They are also used in research. 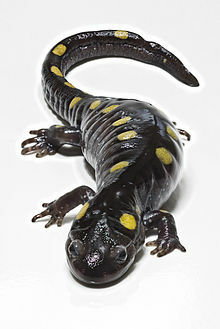 The Tiger Salamander (Ambystoma tigrinum) is an official amphibian of many US states. They are also sold as pets. Wikispecies has information on: Ambystomatidae.